With modern dentistry, anyone can have perfectly straight teeth. Crooked teeth need no longer tar your smile and confidence. Ria Family Dental has orthodontic options you can choose from. Talk to your dentist today! Orthodontics is a branch of dentistry whose main focus is not only to straighten crooked teeth but also to address bite defects and jaw problems. It uses orthodontic appliances uniquely designed to the measurement and needs of the patient. This equipment is worn in the mouth until the desired result is achieved. This period can last up to years depending on your situation. Hence we recommend having the treatment early in life. We encourage parents to sign their child up for an orthodontic evaluation as early as 7 years old. The evaluation assesses possible problems that could be addressed by orthodontics. Invisalign is a popular orthodontic treatment especially favoured by the adult crowd. The trays used are removable and are made of clear polyurethane, or virtually-invisible aligners. Each tray is custom-fitted for the patient. The trays discreetly shift the teeth into their ideal position. Each tray is worn for two weeks, around 20-22 hours a day. Trays should only be removed during eating, brushing, and rigorous sports activities. These are often referred to as traditional braces. They are visible and give the “train track” look. However, today this type of braces are smaller making them less noticeable and more comfortable than before. An orthodontic evaluation is conducted first. An X-ray, impressions of the mouth and jaw, and assessment of bite capacity is part of the evaluation. The result will be the basis for your orthodontic treatment plan. 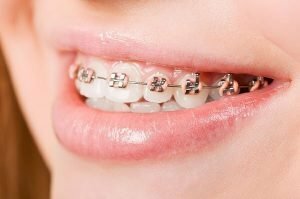 Included in your orthodontic plan will be some do’s and don’t’s and what to expect when you wear the orthodontic equipment. There are some situations in which an extraction is needed to achieve the desired alignment. This is usually in the case of crowded teeth. Once your measurements are taken, your custom-fitted braces will be installed. Follow-up checkups will be scheduled. Say goodbye to crooked teeth and hello to straighter teeth alignment with orthodontic options at Ria Family Dental. Achieve the smile of your dreams today! Talk to your dentist about your orthodontic evaluation.